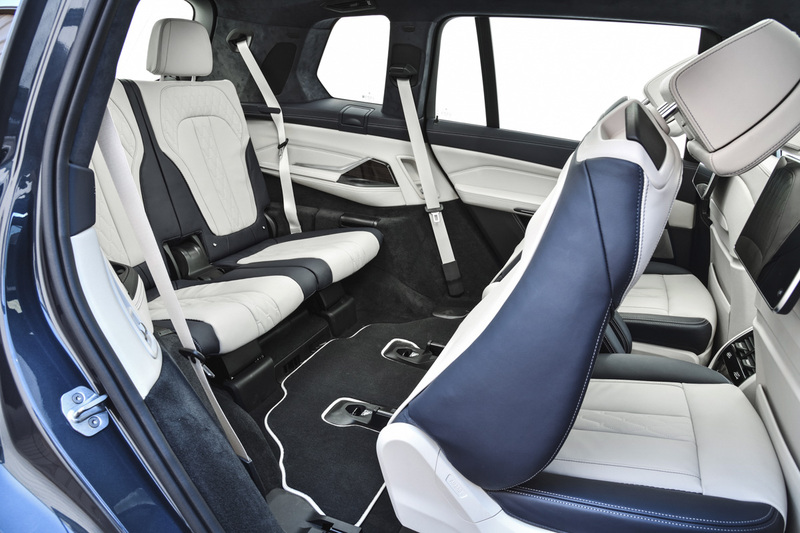 BMW’s flagship SUV is a veritable comfort zone. BMW’s X7 concept car has been doing the motor show circuit for about two years, during which time we have slowly become accustomed to its huge physical size and exaggerated grille. Now with the production X7 finally on real world roads the true scale of BMW’s flagship SUV is apparent. 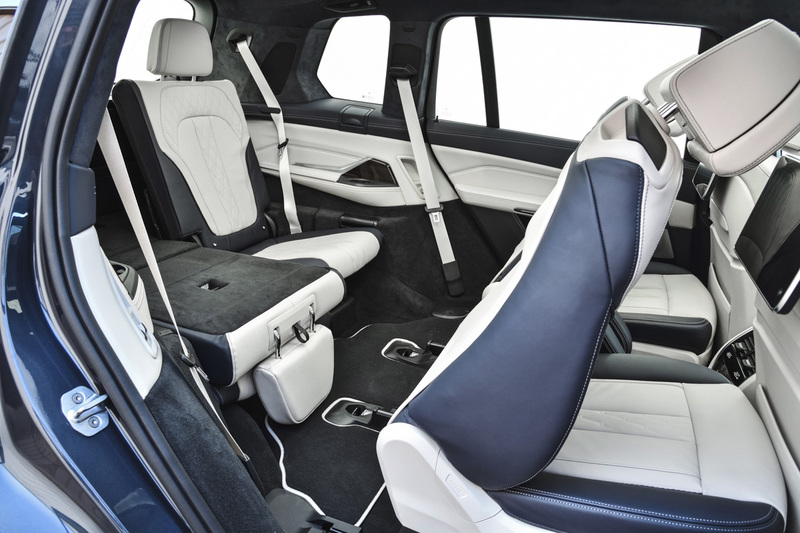 To underpin the sense of ultimate SUV luxury the X7 has air suspension as standard. Beyond that the IAS rear wheel steering and active anti-roll stabilisation, which help to make the car feel more agile and indeed ‘smaller’ on the road. 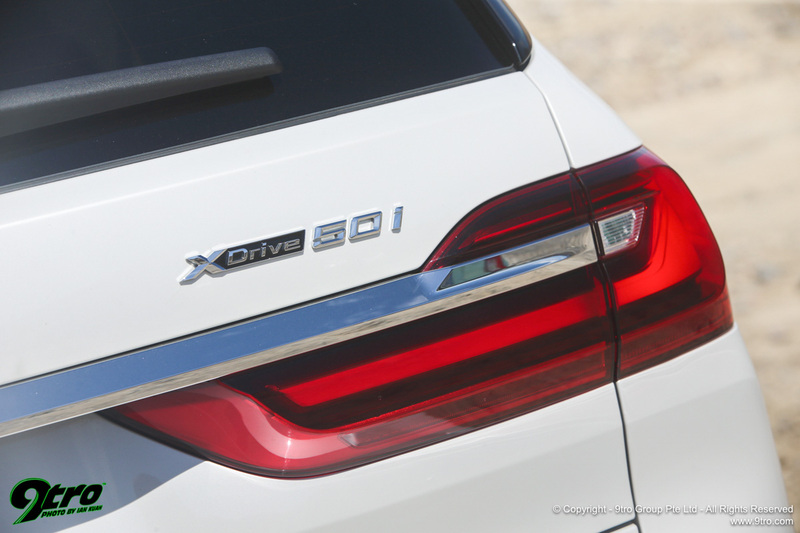 These are standard on the V8-powered X7 xDrive 50i in the US and optional on the entry-level six-cylinder X7 xDrive 40i. They are also optional on the 30d and M50d diesel models that will make up the staple sales in Europe. 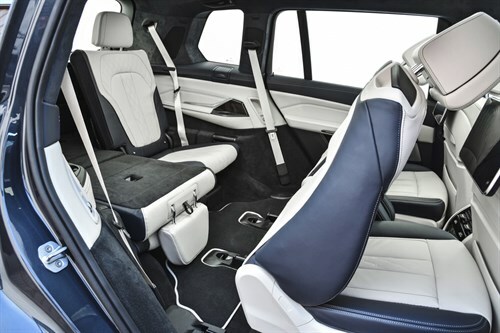 Another refinement that aids cabin isolation is acoustic double-glazing all round, while the electronically actuated sound flap exhaust goes quiet in Comfort mode and takes on a more aggressive tone when you engage Sport mode for the drivetrain. That is the driver’s choice. 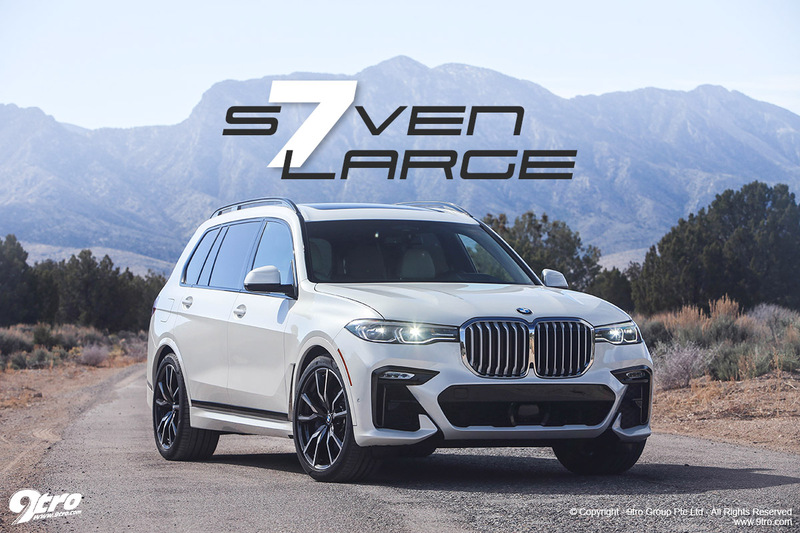 Thanks to good proportions it is not that easy to discern the X7s actual physical size from a distance unless there is another vehicle or object of familiar size next to it. Certainly the standard 8.5J x 20-inch wheels and 275/50R20 tyres help to visually balance the cars proportions. The X7 is 230mm longer than the X5 on a 100mm longer wheelbase, with the extra length concentrated aft of the B-pillar. “The only exterior parts the X7 shares with the X5 are the door mirror cap mouldings, so it really is an all-new car in terms of exterior cladding,” said Jörg. 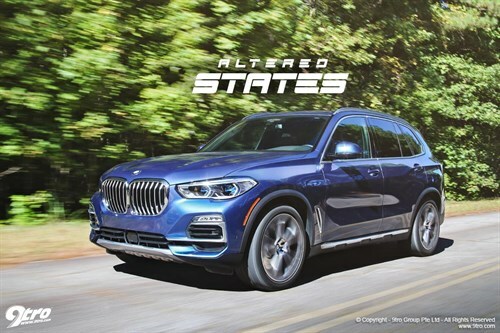 BMW X5 - Altered States28 Sep 2018The latest X5 graduates from finishing school. 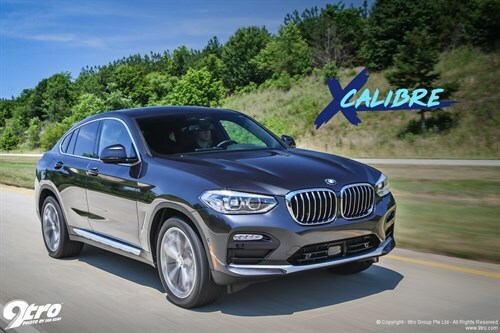 BMW X4 - X Calibre01 Jul 2018The new X4 makes the cut. There is no escaping that exaggerated front grille and massive air intakes in the front bumper that deliver an aggressive front with real autobahn overtaking presence. Those intakes certainly look capable of Hoovering up domestic animals when the X7 is on the prowl in town. Meanwhile, the big, bluff nose seems to defy the reasonable 0.34 drag coefficient, although you have to bear in mind the 3.0 sq. m frontal area. 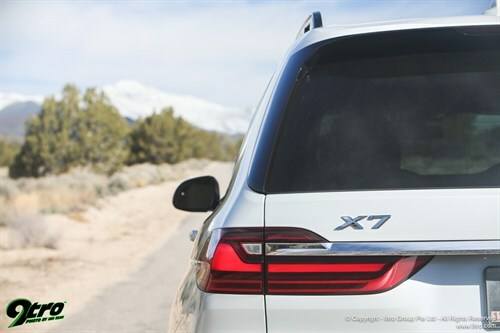 The X7 is a master of the disciplines that define a luxury vehicle, particularly in its cabin, which is spacious, comfortable, refined, and blessed with extremely low levels of wind and road noise. Drivers of the current generation X5 will be familiar with the instrument pack, infotainment system, and the heating and air-conditioning controls, which are very similar. 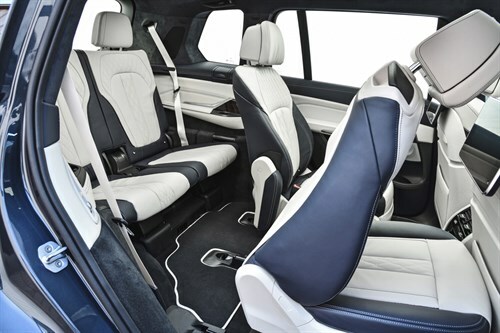 The fact that they are in keeping with the status of the larger and more expensive X7 speaks volumes for the design integrity and sheer quality of the X5 interior. The stitched leather on the dashboard top roll, aluminium trim around the classy wood inserts in the centre console and general premium look and feel of all the cabin fittings are exactly what you expect of a flagship SUV at this level. The optional two-tone leather on our test cars was absolutely gorgeous and of very high quality, with the perforated leather centre panels facilitating both heating and fan cooling. Many of the features we have already seen in the new X5’s cabin are repeated here but some options are standard on the X7. The crystal glass gearknob, induction charger for a mobile phone in the centre console, and cup holders with cooling and heating are just some of these. While this latter feature has been seen before this is the first time that you can cool one and heat the other in tandem. 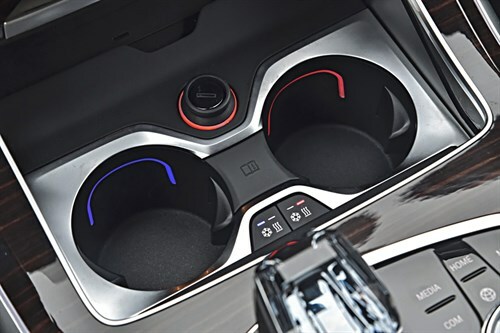 Train spotters should note that the mobile phone induction charger is aligned east-west in cars with the heating/cooling cup holder feature and north-south in those with it. Versatility is the name of the game in the cavernous interior. 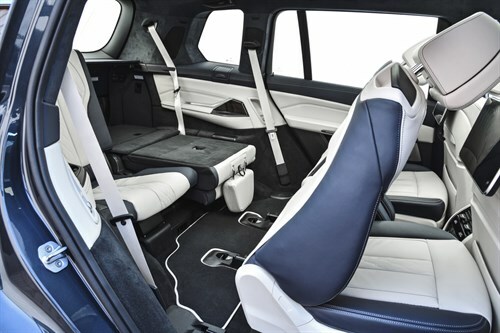 The difference between six and seven-seat configurations lies in the centre row where you can specify either two individual seats or a bench seat for three. Folding the seats is the work of opening the split tailgate and pressing the buttons on the side of the rear compartment to activate the automatic folding mechanism. The lower section of the powered tailgate can carry up to 150kg allowing two people to use it as a seat. The full-length glass panorama roof is another great feature. 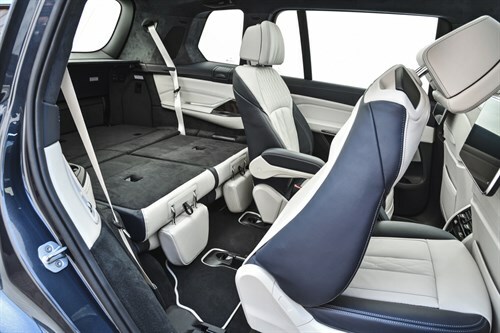 Because the X7 has a third row of seats, the glass roof with its motorised sliding cover has a smaller section over the rear seats too, and the air-conditioning has a fifth zone covering the third seat row. The Bowers & Wilkins 3D audio system has additional roof mounted speakers for a more realistic sound field. With the third seat row folded flat the boot holds 326 litres of cargo, and with all the seats folded the cargo area will swallow a massive 2,120 litres, significantly more than any estate car on sale today. 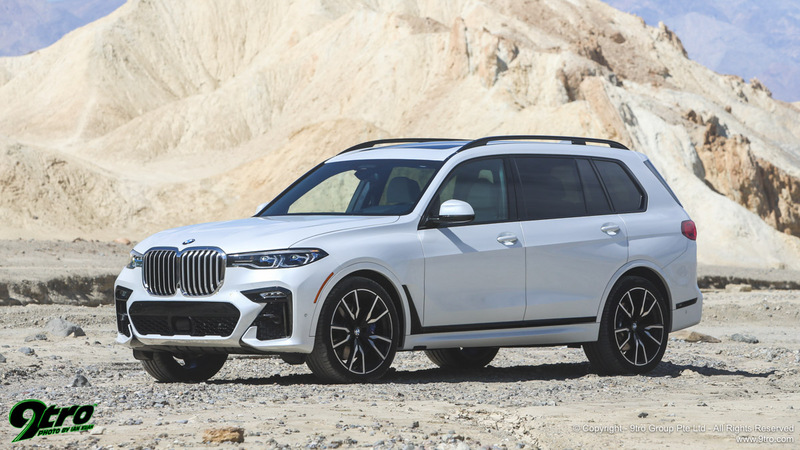 Given its sheer size and weight there is no way that the X7 is going to feel as agile as its smaller siblings, but that was never the deal. As a car like the X7 is more a chauffeur driven luxury conveyance, particularly in China and the Middle East, its passenger cossetting qualities are far more important than any perceived fun for the keen driver. 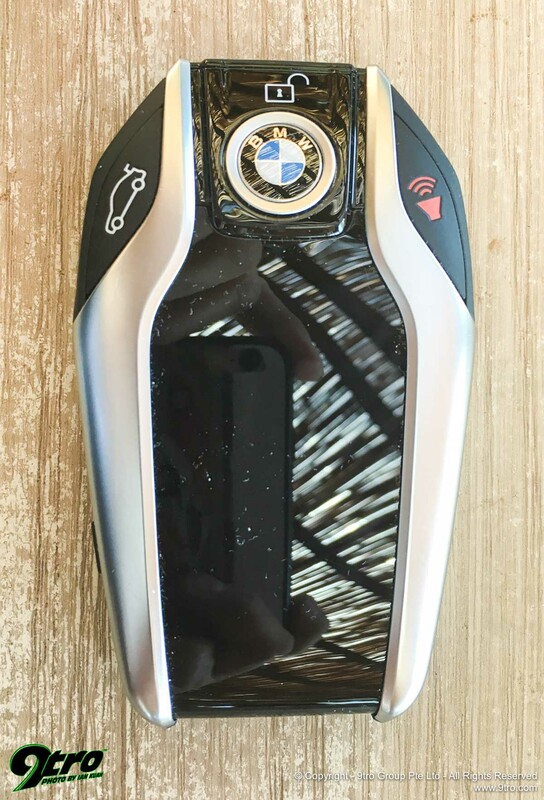 In suspension hardware terms the single chamber air suspension is similar to the optional system on the X5, but with some additional components and bespoke control mapping. The ride height drops 20mm in Sport mode for a lower centre of gravity. Combined with the IAS rear steering and active anti-roll bars this makes a palpable difference to agility on a twisty road with ride comfort hardly compromised. Our X7 50i test car was fitted with optional IAS (Integral Active Steering) rear-wheel-steering, and the active anti-roll bar system. 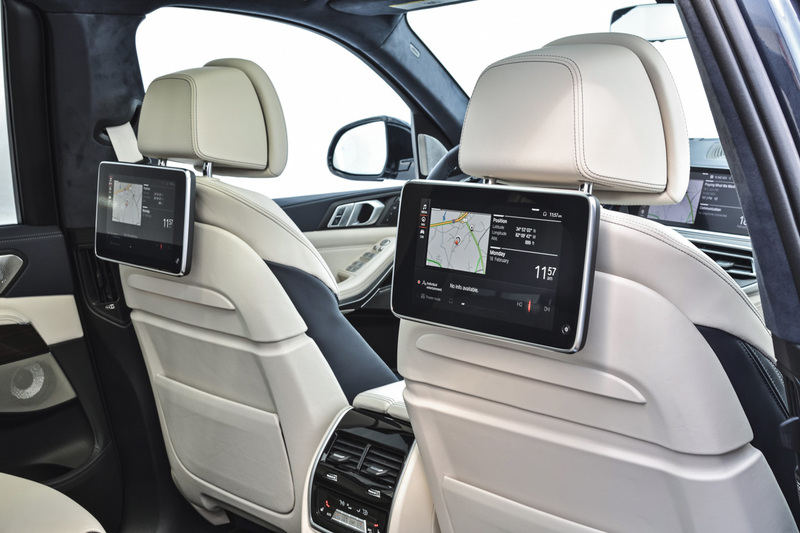 Both are also offered on the six-cylinder but were not fitted to our 40i test car, so we were able to compare and contrast the difference these systems make. 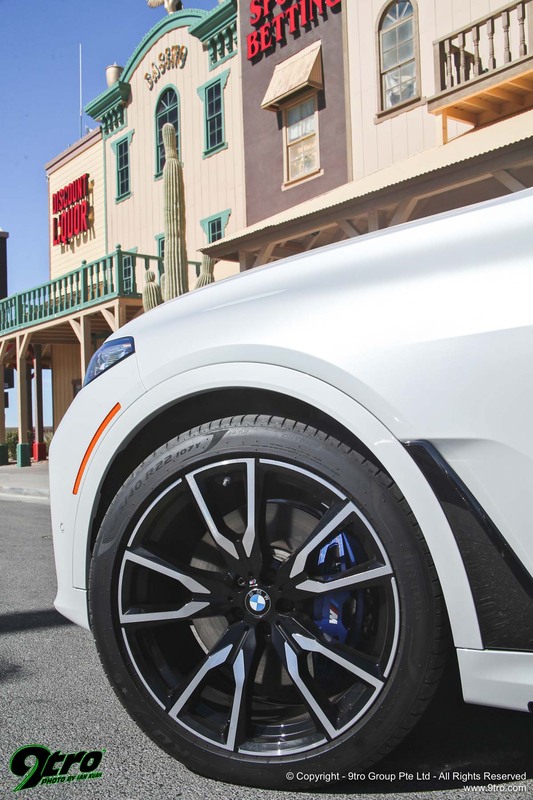 There were plenty of dips and long wave undulations on the open roads on our test route from Las Vegas to Los Angeles that took in the Death Valley area, and the X7s body control and composure was quite impressive when negotiating these at speed. This was especially so on the 50i with the active anti-roll bar system. The combined effect of the active handling assistance systems is particularly apparent from the rear seat of the X7 40i from where the physical effects of the steering inputs by the driver were felt more keenly than in the 50i. 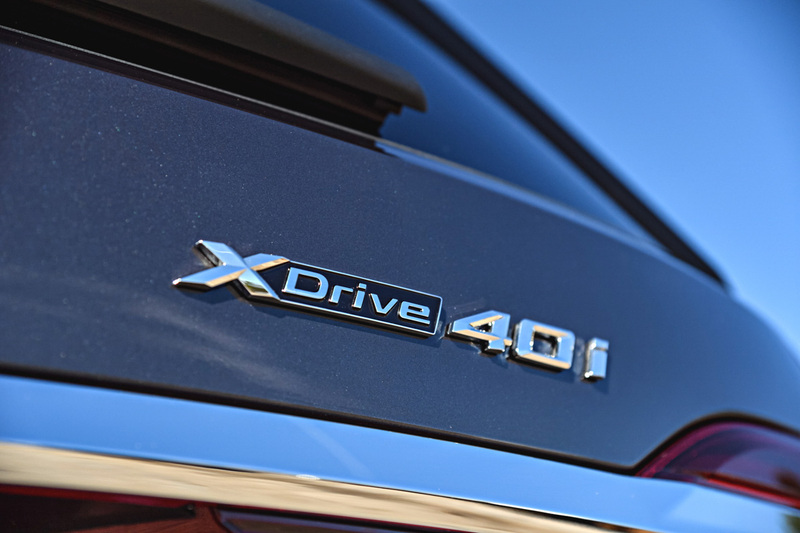 As you would expect of a car vying for a top spot in the rarefied air of luxury SUVs the X7 provides a cossetting secondary ride that soothes away bumps at low speeds. The isolation from road noise and tyre thump is also impressive and makes for a very serene ride. As the X7 is tall with a high ground clearance we were surprised to learn that the side steps are not standard. “They are standard on the M Sport package but are otherwise optional,” Jörg explained. As the car can be lowered 40mm at the touch of a button inside the tailgate to aid loading some people think the steps are not required, but that is a personal thing. Despite the double bulkheads that help to prevent unseemly mechanical noises from permeating the calm of the cabin you can still hear a faint V8 growl from up front on full throttle. But since an engine befitting a car of this status needs to have aural gravitas this is no bad thing. The TwinPower Turbo 3.0 litre six-cylinder motor has 340hp from 5,500 to 6,500rpm and 450Nm of torque between 1,500 and 5,200rpm that generates a decently brisk 6.1 sec 0-100km/h time. But in the luxury world how numbers are achieved is arguably more important, and on that basis the 3.0 litre six, normally a brilliant engine in a much smaller and lighter vehicle, just scrapes over the adequate line here. While it is a smooth and willing engine the straight six soundtrack is more polite than powerful, and its mere 450Nm is not going to set the world alight when asked to haul 2,395kg (EU) with any sense of urgency. A straight six has certain harmonics that need taming with a dual chamber rear exhaust silencer. From the rear seat those harmonics are detectable at some engine speeds, so the six is simply outclassed by the V8 in this application. While both engines will be available in the US market, Europe and Asia will only get the 40i at first, with the V8 following at some point down the road. However, European markets will receive two 3.0 litre turbo diesel variants, the 265hp 30d, and 400hp M50d with a thumping 620Nm and 760Nm torque output respectively. The M50d matches the 5.4 sec 0-100km/h sprint of the 50i while using 40% less fuel. It will thus be the perfect balance between driveability and fuel economy for most people. On the wide US highways and byways, even a car the size of the X7 feels relatively compact compared to the hulking Chevy Suburban and Ford F150 that ply the roads. On much smaller European roads the X7 is outsized, and using multi-storey car parks where even an X5 is too big is a non-starter. However, as a luxury six or seven-seater, and especially as a point-to-point chauffeur driven conveyance the X7 is both versatile and convincing. Its high quality interior, cossetting ride, and features like the full-length panoramic roof make rear seat occupancy a first tier luxury experience.